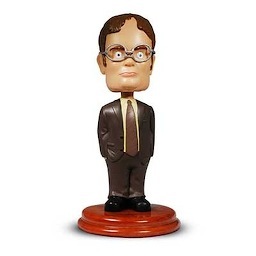 The NBC Universal Store reports selling more than 150,000 Dwight Schrute bobbleheads modeled after the vainglorious Rainn Wilson character on The Office. That makes it the most popular item in the eight-year history of the store. It's also prompted the show's executive producer, Greg Daniels, to quip somewhat lamely, "Yes, they are fun, but they also serve a business purpose. People who want to manage by consensus can buy six and keep them nodding all the time to whatever they say." Dwight retails for $19. If you want to order one, go here. ***A fine group of Dallas Cowboys Cheerleaders are gathering on the Thursday, Jan. 24, two-hour edition of Fox's Are You Smarter Than a 5th Grader? The "pretty pom-pommers," as Fox puts it, will surprise a Cowboys fan from Sunland, CA and "help him tackle questions about elementary subjects." Said contestant can either team with the show's five resident "whiz kids" or huddle with the Cheerleaders in search of an answer. Which leads Fox to ask, "Will the cowgirls' beauty be a distraction or do they have the smarts to prevent his contestant from fumbling?" Fox also has provided a sample 2nd grade level question facing the contestant: "Zero degrees Celsius is equivalent to how many degrees Fahrenheit?" That seems pretty steep. When I was a second-grader you could go to the head of the class for knowing the answer to, "What color is an egg white?" ***NBC is readying another new reality show, this one called Celebrity Circus. The Peacock says you can thrill to the sights of celebs performing "alongside avant garde professional circus troupes in a visually arresting format." This rekindles fond memories of CBS' old Circus with the Stars specials, where you easily could separate A-listers from lesser types. On one edition, Bob Newhart got to spin plates while evangelist turned two-bit TV star Marjoe Gortner was strapped to a car hood and driven through a flaming wall. He got to wear a helmet, though. Honest.